There are new bars. There are innovative bars. And there are those with a consistently solid track record. In fact a track record so impressive that some figure among the “world’s 50 best bars”. London Cocktail Week is considered to be one of the biggest events of the global bartending scene. This is where new trends first appear; this is (and always has been) the centre of new developments in the drinks industry; this is where the most important figures and companies from all over the world celebrate each year, at an event that always grabs the headlines. But this year there was an additional reason to smile. 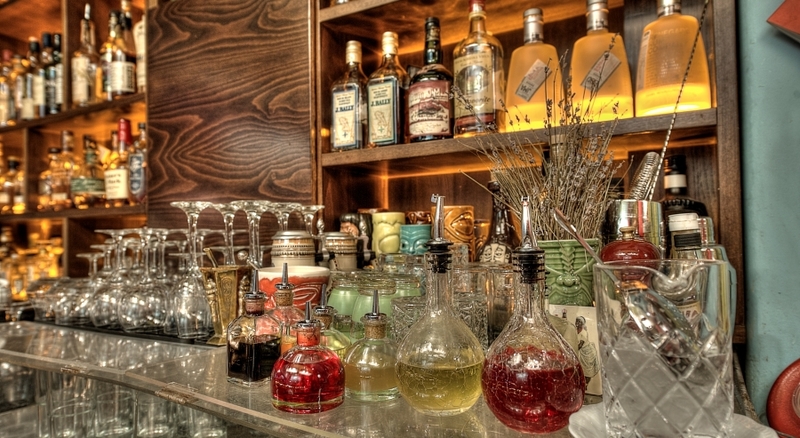 Baba Au Rum, one of the top bars in downtown Athens made it to the list of the “world’s 50 best bars”. And my aim this week is to find out why. It opened in March 2009, in a city and on a continent that knew very little about the latest developments in bartending. For its time, it was pioneering. It was among the first cocktail bars in Athens and one that always made an effort to “educate” its clientele. How? “When we opened we didn’t even serve Mojito. People were asking for it because they didn’t know what else to drink. But we proposed our own variations that were well received and are now firm favourites.” The words of the bar’s owner and creator, Thanos Prounarous, go a long way to describing the concept behind it. Before Baba, we would drink at Bar Guru Bar. And the drinks were great. We also danced. There too, the drinks were from the very capable hands of Thanos, who we already knew from Inoteka, then Zaza, and a little later, Skoufaki. “I wanted to open a bar that had something new to offer. Something extra,” Thanos tells me... as the story of Baba Au Rum begins to unfold. It’s not easy to describe this particular bar. But what’s certain is that its fine reputation and the fact most people know that the drinks here are very good is mostly due to this guy. Some of the biggest names on the contemporary Greek bartending scene frequent Baba Au Rum and it’s always a good sign when you get the thumbs up from successful colleagues. From as early as 2009, Baba Au Rum offered one of the most remarkable selection of drinks in the city, with – as the name suggests – a particular emphasis on rum. When it opened it had 60 labels on the shelves, a figure that has since grown to an impressive 200. Why rum? “We need to specialise,” Thanos says. “Rum offers the most options. You can make a really pleasant drink or you can enjoy it straight, like cognac,” he adds. So, this is how Baba Au Rum started and its subsequent course has been characterised by consistency. The drinks list changes almost every year but it always includes some of the most popular cocktails one would expect to find at good bars. Thanos and his current team, comprising Nikos Gartzolakis and the ever-gracious Ilias Stergiopoulos, begin their menu with “cocktails you should drink at least once in your life”. These are followed by rum-based concoctions and continue with house choices that have become very popular. The drinks at Baba Au Rum don’t try to be innovative. They don’t even aim to impress in terms of technique. But they are drinks we have all loved, with bases we can all appreciate, and a taste with which most of us like to enrich our evenings. Here you will drink rums from Guyana, be offered Barbados aged rums, sip Cuban gems or tiki treasures from the Caribbean. You can ask Thanos for one of his five daiquiri variations or opt for his consistently wonderful classic recipe. He may propose a Ray Barrientos with Zacapa 23, sugar, lime and orange juice and Grand Marnier or suggest one of his best sellers, an RnB (Rum and Brandy) Crusta. The star of the show will undoubtedly be the Zombie, which is in fact one of the best in Athens. In a tiki glass, with brightly coloured straws, homemade falernum, but with a special blend of rums unlike any other, since the spirits used by Thanos have been brought back from one of his many trips. You may stick to the classic recipes. If you ask for a Boulevardier, you may be asked if you have a particular bourbon preference. You may want a Negroni but be tempted to try the Negroni de Maestros made with Havana Club Selección de Maestros... and you won’t be disappointed. It is so special that some of us don’t want the slightest change. 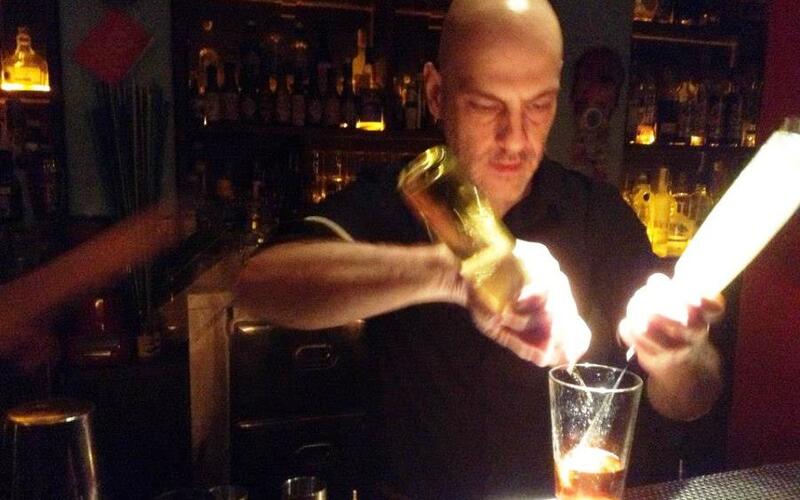 Most of your drinks will be made with homemade bitters and syrups, for Thanos Prounarous was one of the first bartenders in Greece to propose his own recipes based on these. And they will always be up to the same high standard. It is precisely this consistency that Baba Au Rum strives to maintain. Did you see something on the menu? That’s what you’ll get. It won’t be changed because of the bar’s different philosophy. You won’t get a variation because you could quite easily have chosen something else that suits you better. Baba Au Rum is a “flexible” bar. It’s tiki but also fancy. It’s ideal for late afternoon and early evening, yet it’s also one of only a handful where the fun continues at night with dance music. But above all, it’s consistent. As well as one of those rare bars which respect non-smokers. Its attention to detail is admirable, while the drinks it offers are always outstanding, with more than a dash of “memorable” and generous measures of “unique”. So, is Baba Au Rum one of “the world’s 50 best bars”? Well it’s definitely one of the most serious (in the positive sense), mainly because it has stuck to its beliefs from the outset. Indeed, so much so that its reputation has spread around the world. Will anything change? Quite a lot in terms of the actual space, but that’s being kept as a surprise. What else? Well I can tell you that the new menu will feature detailed tastings for each drink, along with a brand new category of “Unusuals”.